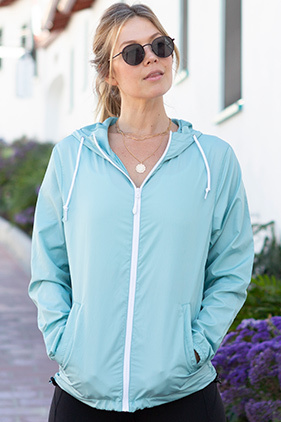 100% polyester lightweight water resistant fabric. 82 Gm. Matte finish eyelets and zippers. #4 zipper with zipper pull & rubber zipper pull tab. Reversed zipper tape. Fine mesh hood liner. Three panel hood. Scuba neck. Self neck tape. Welt pockets with mesh pocket bags. Tightening toggle at waistband. Elastic cuffs. Locker loop in center back.